It’s always a bonus when something turns up regarding the history of Talbot and a few months ago I received a phone call from a Mr David Young who was researching his family tree and was on the lookout for information regarding his grandfather. The person in question was none other than David “Happy” Young who as far as we can fathom out holds the record for the most goals in one game for Talbot, that being 11 in total during a Scottish Cup win over Craigbank. He was born in the now abandoned and forgotten mining village of Dunaskin which was situated between Dalmellington and Patna. He was described as a speed merchant and as well as a prolific footballer where he played with this home side Dunaskin Lad’s, he enjoyed running where he gathered a fair amount of trophies and badges. In September 1912 Young was to sign for St Mirren who offered a wage of £2 and 10 shillings which also included a job in Paisley with JP Coats or Clarks thread mills, both families were shareholder in the St Mirren club. David Young went on to collect a 1912/13 Renfrewshire Victoria Cup medal with the “Buddies” the first out of three times they won the competition. His career with St Mirren is sketchy and he didn’t stay long as the family have an Ayrshire Senior Cup medal which he won with the short lived Stevenston United in 1915, United defeating Kilmarnock “A” 2-1 at Galston in the final. The family still have David’s senior cup medal which is mounted like a key fob and has pride of place in the family heirlooms. What becomes of David after this is unknown, however Ayr United has been mentioned but this is unfounded. In the 1920/21 season he turns up at Talbot and puts in a season that modern strikers can only dream of. For the record Davie “Happy” Young played 47 times for Talbot making his debut on the 11th August 1920 against Cumnock in the South Ayrshire League scoring in a 3-0 win. In his first four games he scored in every game including 4 goals against Mauchline in the first round of the Scottish Cup. During the season 1920/21 Talbot won the league and the Mauchline and District Cup. They were beaten in the final of the Ayr & District Cup and the Cumnock and District Cup. He scored 56 goals in the 1920/21 season in 41 games and 2 goals in 6 games in the 1921/22 season. In the Mauchline and District Cup he scored a hat trick in round one v Cronberry, a hat trick in round two against Craigmark, a single in the 3-3 draw with Darvel in round 3 and then scored four goals in the 5-1 win in the replay. He hit a hat trick in the 4-1 semi final win over Newmilns and scored both goals in the final against Muirkirk Athletic.. In the Cumnock & District Cup final against Glenbuck this went to a replay after Happy scored in the 1-1 draw. Unfortunately during the replay the Talbot fans caused a break in after they went 1-0 down and the game was abandoned with Glenbuck awarded the cup. In the Ayr & District Cup he scored in every round except the final which Talbot lost 1-0 to New Cumnock United. It’s the 11th September 1920 when he is credited with scoring every goal in Talbot’s 11-0 win over Craigbank. The match report described that Davie Young had scored a goal for every opponent he faced. I now believe that this is the record for Talbot. He continued to play for Talbot in the early part of the 1921/22 season playing six games saying his goodbye’s on the 10th September where he scored in a 2-1 win in the Ayrshire Cup against Tongue Row (miners rows outside Drongan). It was from there he left for England to play for Stockport County. As Stockport announce he had a very brief spell with County at the start of the 1921/22 season. He joined the club in September from an unspecified Scottish Southern League side ( Thats us by the way). David’s first recorded game saw him score 2 for the reserves as they beat Bolton Wanderers ‘A’ in a Friendly on 24 September. His first team debut came four days later in the 3-0 Cheshire Medal win at home to Tranmere Rovers. Having scored another 2 in that game he kept his place for the visit of Hartlepools United in Div III(N); ousting Edward Brooks. Following their win County kept the same side to travel to Southport but following a 1-2 defeat Young lost his place as Joe Reid was moved into the forward line. He played one more reserve game before returning to Scotland. The family say he was in dispute with County over his contract and did return to his homeland. Unfortunately he came back with no job and the General Strike in full swing. The life and times of another Talbot legend! Alex Gibson was born in Kirkconell, Dumfrieshire on the 28th November 1939. He showed early promise as a youngster and gained a trial with the Scotland Schoolboys at the age of 14. In true Kirkconnell tradition Alex started work in the pits, playing the game of football in his spare time. Alex signed for Talbot in the 1958/59 season as a centre half in a time that Talbot were heading towards their most troubled times. Alex signed for Notts County in 1959 and like Talbot the County were heading into their worst decade in the club’s history. When Alex made his debut at Gateshead on the 7th September 1959 Notts were embarking on a campaign to gain promotion out of the old 4th Division. This was achieved by ending up runners up with Alex playing in 17 of County’s 46 matches. Alex embarked on a whirlwind ten years that saw relegation, the club seeking re-election to the league and general upheaval. However Alex was well liked by the Notts fans picking up their player of the year durung the 1967/68 season. He also played alongside some famous names like English internations Jeff Astle and Davie Watson. Also a young Don Masson who became a Scotland legend. 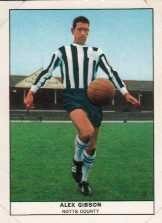 At the age of 29 Alex left Meadow Lane at the end of the 1968/69 season having racked up 347 league matches, 10 FA Cup matches and 16 League Cup games scoring 10 goals. His last game in a County jersey came on the 8th of April 1969 at Workington. Of his ten years at County the club claim that he was involved in a lot of interest by bigger clubs but nothing ever came to fruition. Alex started working in a fruit market in Nottingham and joined non league club Boston United for a couple of seasons leaving in 1972. Also in the summer of 1972 Alex started to work for Jack Dunnett who was the chairman of Notts County at the time. Mr Dunnett was also the MP for Nottingham East. This involved Alex working in his London office and driving Mr Dunnett to Nottingham weekly for his political surgeries. As Mr Dunnett lived in London it also meant the Gibson family re-located to London. Alex kept contact with football through Mr Dunnett who as chairman attended all of Notts County´s matches, home and away. Mr Dunnett would also soon be elected chairman of the English Football League. Alex moved on in the 1980´s and started to work at the BBC TV centre in Movement Control. He worked at the Beeb for a number of years until he took redundancy . Thereafter followed jobs working at Heathrow airport and finally at Sky TV until he retired. In 2000 Alex and his wife Sheila sold up in London and retired back to live in Nottingham. Sadly at the young age of 63, six days short of his 64th birthday Alex died in November 2003. Now Talbot players have won a few gongs in their time, but the most unusual must be the Military Medal won by David Slimmon who lost his life during the First World War. Davie came from Assloss Mains in Kilmarnock although he is remembered on the war memorial in Kilmaurs. His mother was a Mary Glencross from Sanquhar. David joined Talbot in 1913 winning an Ayr & District Cup medal and went on to represent the Ayrshire Reserves X1 and the Ayr and District X1. His footballing prowess was attracting a lot of interest and by the end of the season Davie signed for Kilmarnock. However the Great War saw Davie join up, and was soon sent to Belgium. He served in the Ypres Salient and was killed in action at Beaucamps on the 23rd July 1917 along with 10 other comrades aged 21. He was awarded the Military Medal for bravery in an act that saw him storm a machine gun nest letting his comrades pass in safety. The medal is the forebearer to the Military Cross and was given to NCO’s rather than officers. Many famous people have won it non other than Rangers legend Willie Thorton for bravery in WW11. David was laid to rest at the Hop Store Cemetary just west of Eiper. Reports during the time of his death was British and Canadians were involved in light skirmishes in the Beaucamp region. A week later the third battle of Ypres took place with well over 3,500 of David’s regiment killed in the first day. Auchinleck through and through “Wee Louie” as he was lovingly called by both Dundee and Dunfermline fans was a product of the Dalsalloch Row’s and the Barony pit. Signed part time by Willie Thorton in 1957 and was later to serve under one of Talbot’s other greats Bob Shankly. Hugh’s early career saw him working down the pit Monday to Friday and playing for Dundee at the weekend where he shared digs with the Craig Brown. Hughie made a scoring debut in November 1957 in a 5-0 win over Partick Thistle this was to be the first of his 61 goals for the Tayside club in his 292 appearances. Hugh continued to shine when another Talbot legend Bob Shankly took the helm at Dens Park and in 1961 he was capped for Scotland in a World Cup qualifier against Czechoslavakia where Scotland went down 4-2 in extra time at the Heysel Stadium in Brussells. Reports say Hugh should have been capped more times for Scotland but was up against number one selection Davie Wilson with Willie Johnstone wating in the wings. However Hughie did pull the Dark Blue strip over his head in 1962 when he represented the Under 23 squad against England and Wales. In 1962 Dundee under Shankly captured the Scottish Championship and in the following year reached the semi final of the European Cup losing out to AC Milan. Hughie was injured for both semi matches but made his European mark in the opening round scoring a brace against FC Cologne at Dens park. In 1965 Shankly left for Hibs and Hugh headed for Dunfermline in a £10,000 deal where he racked up 239 appearances and 61 goals, two of them at Ibrox in 1965 when the Pars recorded their first win a the Rangers ground. Hughie added a Scottish winners medal to his league medal in 1968 when Dunfermline defeat Hearts at Hampden. With Hughie now heading towards the twilight of his carer he signed for Arbroath but after 40 matches he retired due to injury, but continued as a trainer at Gayfield. He returned to Dundee and had a spell as coach and chief scout, but in the 1970’s he tried his hand in Scandanavia where he took over third division Danish side Herfolge who he guided to the top flight. Hugh returned to Scotland in the hope that his footballing credentials in Denmark would grab him a managers job, but it was to no avail and Hugh went into the hotel business until his death in 2010. Hughie always intimated that the first score he always looked for was the Talbot’s and as an ex player and Affleck lad he will always be held dear to the Talbot’s hearts. Probably the best keeper ever to fill a Talbot goalie jersey, but his eccentricity was kept for the seniors. Signed from Maybole Juniors he kept goal during the 1973/74 League Cup final where Talbot enjoyed a 2-0 lead against Kello Rovers thanks to Gavin Goudie and Mungo Hamilton only to lose 3-2 after 90 minutes. It didn’t take long for Hugh to sign senior and Ayr United captured his signature in 1974. Sproat over his 22 years as a senior saw him labelled a lunatic as he dribbled and headed his way into Ayr United folklore. 20 years on and the BBC Sportcene programme after a poll amongst Ayr fans nominated him the biggest ever “Cult Hero” at Somerset. He was a legend among rival fans as both sides of the Old Firm can remember his choice of goalie strip during his many encounters with both Glasgow giants. His winding up of the Glasgow masses was recorded in the boys football magazine “Shoot” when he told the reporter. “I’m a punk rocker,” Hugh Sproat explained to Shoot after he’d taken the field for an SPL game wearing a razor blade as an earring, which he had to remove before being allowed to play. Sproat, a milkman before he joined Ayr in 1974, had already made himself a fan favourite for his choice of goalkeeping jerseys when playing either of the Old Firm. He normally wore red for Ayr but changed to green for matches against Rangers and blue for Celtic. Sproat’s heyday was a few years before videoing of matches became widespread so there is relatively little footage of him, but was also known for dribbling with the ball or heading it when he might have punched or caught. For all the eccentricities he was highly rated as a goalkeeper, making over 200 appearances for Ayr and a further 150 for Motherwell. At Motherwell the trend continued, but there was a story where either at Ayr or the “Well” he was on his way out to the field at Parkhead with his blue jersey on when Jock Stein stopped him and said “Son., take that jersey off because there’s enough loony’s out there without you winding them up. 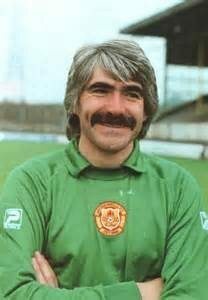 Sproat was idolised by the Motherwell fans and he won their greatest Fir park moustaches competion in a attempt to put fun in the game, a trait that Hughie had done throughout his career. Joker or athlete Hughie racked up 189 appearance for Ayr and 145 for Motherwell. He was another Talbot great. Just to show how much fun Hughie put into football a prominent programme seller described the Motherwell v Forfar programme as such. The example shown above may have fallen somewhat short but nonetheless it did demonstrate one possible use of a matchday programme – scare the opposition into submission before the game has even taken place. Certainly that seems to be the idea at work in this effort from Motherwell. You almost suspect that they passed copies around the Forfar strikers before the game with the warning “don’t try to score; Hugh Sproat’s moustache hasn’t eaten in days”. Either that or they wanted to entice more female supporters through the turnstiles and thought that putting a bit of beefcake like Shug was the way to do it. Not a player but a god in Auchinleck, Willie Knox holder of the British Empire Medal for his services to football and the community will always be held with high esteem by the Talbot faithfull. A gritty down to earth man who learned the hard way in the backwaters of football playing for the likes of Raith, Forfar and Third Lanark. Many stories have been told about “Knoxy” but in 2005 the magazine Mud and Glory ran an article on Willie. Manager Willie Knox won the Scottish cup five times with Auchinleck Talbot, but he recalls that his move to rivals Cumnock caused just as much of a stir. Willie Knox has finally admitted he was probably wrong to take the Cumnock job. No kidding. After more than a decade of remarkable success at Auchinleck Talbot – including five Scottish Cup wins – the legendary manager crossed Junior football’s greatest divide – and got their most bitter rivals relegated. If Graeme Souness had quit Rangers for Celtic, it wouldn’t have caused a bigger stir. But Knox was never one to avoid controversy. He was sacked as Scotland boss after just one game. Almost as brief was his managerial swansong at Irvine Meadow; a few months when, he now admits, his appetite for the game had gone. It is little wonder that Junior football ran out of challenges for Knox, a player with Raith Rovers, who had starred alongside Jim Baxter, but who made his name in a tiny Ayrshire mining village. Backed by a population of just a few thousand, Talbot lifted the Scottish Junior Cup five times in seven season from 1986 to 1992, including an unprecedented three-in-a-row. Defender Ross Findlay tells a similar story of how, at 2-0, Knox pulled a swatch of carpet from his pocket, said he was going shopping the next day, and asked the subs if they thought his son would like it for his bedroom. Anyway, by half-time a goal from Jim O’Donnell and a double from Tom MacDonald had put Talbot 3-2 up. Job done. Auchinleck beat Kilbirnie Ladeside in 1987 and Petershill the year after. In 1991 and 1992 Newtongrange Star and Glenafton Athletic became victims four and five. “Aye, there’s a lot of talk about who was the best Junior team,” agreed Knox, saying nothing… and everything. In comparison with his amazing record as a manager, Knox the players is almost forgotten. However, he had a successful career at Raith Rovers before Bob Shankly signed him for Third Lanark. From there, he went to Barrow, Rotherham and Forfar. These days, the retired grandfather of four lives quietly with his wife of 40-odd years, Sheila. He’s president and taxi-driver for Balmoral Boys Club Under-14s in Kilmarnock. Aye, they have to put up with his “guff” too sometimes, he says. There’s a generation of Auchinleck players – many of whom have gone on to management themselves – who will argue he spoke a whole load of sense. Published in Mud and Glory, January, 2005. Bob Shankly signed for Talbot in Augus t1929 his debut against Cronberry Eglington in the South Ayrshire League. He was to make 25 appearances for Talbot his last game being the Irvine Herald Cup Final against Benwhat Heatherbell. Talbot lost this final 3-2 but won a protest but by that time Bob Shankly had joined his beloved Glenbuck. Never a prolific goalscorer he scored 3 Talbot goals at the Inside Left position. Bob was the second youngest of five brothers. All who have played Football with the local Village Team of Glenbuck Cherrypickers. The eldest was Alec (Sandy) he played Left-half with Ayr United. Then there was Jimmy who had played with a host of clubs among them Portsmouth, Southampton, Sheffield United, Halifax, Southend United, Barrow and Carlisle. Jimmy still holds the goal scoring record for Southend United with 35 goals in season 1928/29 season. John the one before Bob played for Portsmouth, Luton, Alloa, Blackpool and Morton. Then came Bill (Willie) the baby of the family whose career brought him an FA Cup winners medal with Preston via Carlisle and taken him to the Manager ship of Liverpool. The name Shankly was synonymous with soccer, on his mothers side his Uncle Robert Blyth became Chairman of Portsmouth having played with them, Rangers, Middlesboro, Preston and Dundee and his brother William was Chairman of Carlisle having played with them, Portsmouth and Preston. Bob’s own career started with Auchinleck Talbot, then Glenbuck Cherrypickers, Alloa, Tunbridge and Falkirk. He then had a spell as Coach with Stenhousemuir then he became Manager of Falkirk, Third Lanark, Dundee, Hibs and Stirling Albion where he finally became a Director. His initial life was hard in Glenbuck and Bob loved to talk about those early beginnings where he used to work in the pits, like all his brothers they all hated it which probably gave them the added edge to make careers out of Football. His father John was a tailor and his mother used to make Porridge thick enough to slice so it would do them for a week when they reheated it. Anyone who had a notion for making Football a career Glenbuck certainly was the place to be born. Knock on any door and you would surely find a player. The Shankly’s lived in Cottages known locally as Miners row or Monkey’s row, they then moved to No.6 Council Houses. Many a successful player had come from the small village of under 1000 people. Sandy Brown of the Spurs FA Cup winning team was reputed to have come home on holiday and put the Trophy on display in the Co-op window. The hub of the village was the Cherrypickers ground where the boys used to look forward to the close season to see the Professional Footballers some of them Internationalists come home. In fact there used to be games of Football between the boys who’d made good and the stay at homes. Bob admits there were probably better players than him that just didn’t have the ambition to make it. In 1931, Bob met his wife Greta in a chip shop in Muirkirk and they were married in 1936 they had two children one boy John and a girl Margaret. Later John was offered a trial with Dundee from Willie Thornton, but Bob wanted John to finish his Civil Engineering Apprenticeship as there was no money in Football at that time, Margaret kept up the Footballing tradition though by marrying Dundee United defender Jimmy Briggs. Bob’s greatest disappointment in Football was when he just missed out on the chance of playing for Scotland against England, in a half back line that would have been made up entirely of players born and bred in the tiny Ayrshire village. Those players were Willie, Bob’s brother and Tommy Brown of Hearts. Bob was reserve to Bobby Baxter who had picked up an injury, but unfortunately for Bob, Bobby was declared fit two days before the game. Bob first signed for Auchinleck Talbot on the basis of “buy your own playing gear’. The Glenbuck Cherrypickers for whom all his elder brothers had all played were temporarily out of existence. When they reformed the following year Bob immediately signed for them. Bob’s next door neighbour, Jimmy Nesbit played for Ayr United and a trial was set up for him to play against Hibs at Easter Road. Bob scored 3 goals that day for Ayr but wasn’t given any credit, so returned to Glenbuck dejected. Ayr did eventually come back for Bob, but he decided to ignore Ayr and went on trial with St Mirren instead. Senior Clubs began taking notice of Bob, his brother John who played with Alloa told him they were interested. He wasn’t too keen to join them, but when the Alloa Secretary John Reid turned up in Glenbuck with a signing form. He reckoned that if anyone had made the tortuous journey to Glenbuck to sign him they had to be keen so Alloa got his signature. This was the sort of man Bob was, he respected others and was fair with it. Ironically Bob’s first game for Alloa was against Dundee in the Penman Cup which Alloa won 2-1 with both Bob and John getting the goals. Bob then left Alloa and joined Tunbridge who were an English non League side with ambitions. They had already signed Frank McMenemy son of the great Jimmy , and Centre Forward Jimmy Smith who’d established a Second Division goal scoring record with Ayr United. Bob scored 68 goals in a season and returned to Scotland the following year 1933 and had trials with Falkirk. According to Bob that’s where fate stepped in. Unknown to him at the time was the fact Mr Reg Taylor the then Preston Secretary was at his mothers house in Glenbuck in a bid to get him to Deepdale. There was no doubt in Bob’s mind which club he would have chosen, as his brother Willie had just been transferred from Carlisle to Preston and he would have gladly taken the chance to have joined him. Moreover, the English club in the early thirties were at the height of their fame as “Proud Preston’. Bob’s mother had told Mr. Taylor that he was at Falkirk for a trial. He had stopped overnight somewhere and motored North the next day. By the time he arrived Bob had already committed himself to Falkirk. Bob often wondered where his subsequent career would have taken him, if Mr Taylor hadn’t stopped overnight, or arrived in Falkirk an hour or two earlier. It was with Falkirk that Bob ended up under the Stewardship of Tully Craig. Falkirk had just been relegated and Tully decided to rebuild the Team around Bob Shankly who had been moved from Centre Forward to Pivot. 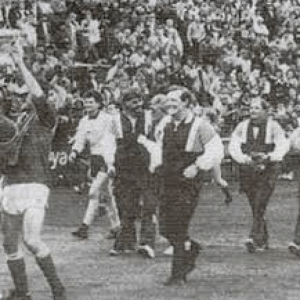 Falkirk were promoted at the first time of asking and reached the semi-final of the Scottish Cup the same year. This was probably Falkirk’s most prosperous periods up to the outbreak of the 2nd world war. Bob included in his social circle players like Scott Symon and Jimmy McGrory people he had the utmost respect for. His all time favourite player however was Stanley Matthews. Falkirk was the last team for whom Bob played, when he retired from playing he took up a coaching position with Stenhousemuir. He enjoyed his Football there and had fun during those days. Falkirk then loured him back as Manager and he held this post for 5 years, but by his own admission he never felt comfortable being the Boss at the club he’d been a player. He then moved to Third Lanark and he enjoyed his two years with them, he was one of the few who had pleasant memories for the ill fated club. It wasn’t the fact he joined them when they had a £20,000 debt which he had cleared before he left, he genuinely found enjoyment there for winning wasn’t a passion. They never expected to win anything and only wanted to stay out of trouble and have a bit of fun out of the game. Bob reckons that’s where he grew up and became independent as it was from there he joined Dundee. He spent 6 years at Dundee as Manager joining the Club in October 1959. This was undoubtedly Bob’s most successful time in Management. He still commuted from Kincardine for the first two years of his Managerial spell at Dundee before finally moving to the City. He joined Dundee when they were languishing near the foot of the table and set to work trying to turn their fortunes around he eventually managed to get the Dark Blues to finish 4th by the end of the 1959-60 Season . Even then the fuel for arguments with the board had begun for Bob as he’d already been forced to sell a young Jimmy Gabriel still a Teenager. Quoting “I don’t want to sell a player, but how can I refuse good money for an apprentice who’s not proven himself yet”? Tragedy was to hit the Shankly’s when Bob’s older brother John died of a heart attack at Hampden whilst watching the European Cup Final Eintracht v Real Madrid. There was another key figure at this game also, a very young Dundee defender Ian Ure. He used the skill which he’d witnessed at this match as his own personal benchmark. So the young Jimmy Gabriel already had an able replacement. Liverpool were invited to play in the match to christen the new Floodlights at Dens, although they were currently in the English Second Division Liverpool were about to start their own march to success under the guidance of Bob’s younger brother Willie (Bill). It was a game which Dundee won 1-0. Bob and Willie were very similar characters and to a certain degree their Managerial skills and styles were also similar. Bob made two signings during the 1960-61 Season, Bobby Seith the Captain of the English Champions Burnley and Bobby Wishart from Aberdeen. The Season had started well with Dundee top of the league in October, but injuries plagued most of the Season and they fell away badly so Bob experimented with his line up and they eventually finished 8th. The 1961-62 Season was upon us the season which will live in Dundee FC folklore for the life of the Club, the Season we won the League. The final piece in Bob Shankly’s jigsaw puzzle finally arrived in the form of Gordon Smith. The players had the utmost respect for the Manager as he had shown to others all his life, he loved the game of Football and was his own man, but never sought the limelight. Bob took Dundee onto win the Title by three clear points from Rangers the Team he supported as a boy and a Championship Medal was his at last. 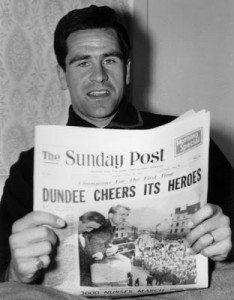 Yes it was the year of Dundee’s European adventure 1962-63 season, there was a mini revolt from the Players wanting bigger signing on fees for winning the League though the players eventually re-signed, was this the beginning of the unrest between the Players, Manager and board? Bob had taken the Dundee team abroad to experience some Continental Football before the Season began this was to prove to be experience well gained come their European endeavours. Bob was every bit the sports psychologist his younger brother was with Liverpool, he changed the Dundee strips back to the V-Neck with which they’d won the League from the new crew neck variety. This seemed to lift the players and their form improved with the change. After Cologne it was Sporting Lisbon’s turn to be put to the sword followed by Anderlecht, then it was AC Milan in the European Cup Semi-Finals. Although technically Dundee were put out of the Semi-Finals in the away game they still managed to save some pride by winning at Dens. Though Dundee were out of the European Cup Bob Shankly’s men had given the Dundee public something to really shout about and be proud of. The 1963-64 season started similar to that of the previous season. Players were asking for better wages and refusing to sign again. This time Ian Ure was adamant he wanted away and despite Bob’s best attempts in trying to keep him the board were willing acceptors of the £62,500 Scottish record transfer fee. Despite this Bob still managed to get Dundee to the Scottish Cup Final that year with George Ryden replacing Ian Ure as Centre half for the rest of the season. It was still a comparatively successful season for Dundee reaching the Final of the Scottish Cup and Alan Gilzean scoring the Scottish all time record number of goals in a season with 50 League and Cup goals. The 1964-65 season was a repeat of the two previous seasons however it was Alan Gilzean’s turn to want away. Bob was determined that the club should hang on to Gilzean as he was the Star player and money should be made available to match Gilzean’s terms. Eventually the inevitable happened and Alan was sold for yet another record Scottish fee to Spurs for £72,500. Though Bob did sign Charlie Cooke from Aberdeen for a then Record fee between two Scottish clubs of £40,000 the selling of Gilzean was a bitter blow to him. Bob himself had refused a new contract as he was disillusioned with the Dundee board and is reported to have said. “They’ll sell the groundsman if you make them an offer”. There ended the great love affair the Dundee fans had with the great Bob Shankly, he resigned in February 1965, there were a few offers for his services but he chose Hibs who had just lost the services of Jock Stein to Celtic. Unfortunately for Bob, Hibs were in financial difficulties and his selling days had not left him he still had to sell the family silverware against his will. Though undoubtedly his greatest signing was that of Colin Stein for just £10. After 3 years of selling Hibs players, the final straw was when even Stein had to be sold for yet another Record fee between Scottish sides of £100,000 to Rangers. Hibs received their Cheque and Bob decided to retire from Football Management altogether in 1968, as it was no longer a time where a Manager was allowed to build a team for success, but money was more important to the directors. This wasn’t the last we’d hear of Bob Shankly though as he was scouting for Nottingham Forest when Frank Smith of Stirling Albion managed to convince him he should still be a Football Manager, the lure to become a Manager again was obviously too great and in 1971 the great man was back in Scottish Football again. The irony of Bob joining Stirling Albion was there were now two great Shankly’s at Football grounds called Annfield. Granted the Liverpool one only had the one ‘n’, but it was another example of the closeness of the two brothers. Bob Shankly the Legend spent two seasons as Stirling Albion’s Manager and he missed out on promotion narrowly both seasons. In 1973 he stepped upstairs as Stirling’s General Manger and took a position on the board. He eventually gave up the role as General Manager in the late 1970’s but remained on the board. Dougie Gardiner like Bob Shankly before him only played one season at Beechwood before hitting the dizzy world of English senior football. However even though the talented wing half made a name for himself in the higher echelons of the senior game his amazing story revolves around a Southern League club in the late 50’s. Born in Douglas, Lanarkshire in 1917 Dougie made a name for himself in the local Douglas district but his footballing clubs and his war record have drifted into the mists of time. By the time Dougie joined Talbot he was 28 years old and whether he had attracted interest before the war is unclear but one season at Beechwood surely wasn’t enough to bring him to the attention of Luton Town. Gardiner signed in the summer of 1946 when Luton were enjoying a good spell in the old Division Two with the likes of Man City, Fulham and Newcastle to name a few. In the six years that Dougie enjoyed his time at Kenilworth Road, Luton never made a concerted challenge on the league title but were never in any danger of relegation. It was the FA Cup that his team were making their name especially after Gardiner joined. In the seasons between 1946 and 1949 Luton reached the 5th round of the national trophy three times. Losing 3-0 at Burnley in 1947, 3-1 at QPR in 1948 and finally 3-5 at Leicester in 1949. Dougie reached the highest honour with Luton when he was made captain in 1948 and continued playing with the club until 1951 making 134 appearances in league and cup, scoring two goals. At the end of his senior career at 34 years old Dougie was enticed to Bedford Town in the Southern League in 1951 by the then player manager ex-Arsenal forward Ronnie Rooke. Bedford were a progressive club and had a major plan to gain league status and rebuild their ground which was called “The Eyrie” due to Bedford’s nickname being the eagles. Gardiner’s first season was a momentous moment for the club after winning the Hunts Senior Cup beating Cambridge United 4-1 in the final. Bedford also reached the 1st round proper of the FA Cup for the first time only to lose 2-0 at Swindon in front of 16,000 fans. League performances throughout Gardiners playing career at Bedford were of little note as the club struggled maintain a settled side. They were however involved in an amazing FA Cup 3rd round qualifier when in the 1952/53 season 15,327 turned up at Peterborough to watch the home side win 2-0. This is reputed to be the biggest non-league crowd ever. By the 1954/55 season Dougie was the captain of the reserve side as the years were slowly catching up. By the end of this season he had retired racking up 92 appearances. The following season Rooke was replaced as manager by Irishman Tam “Tim” Kelly who made Gardiner his second in command by appointing him team coach and trainer. The pairing had an amazing effect on the team and after a few qualifying FA Cup rounds Bedford defeated London amateur side Leyton 3-0 in the 1st Round proper which gave the a crack at Watford in the following round where they won 3-2 at in London in front of 13,500 people. Bedford became the subject of the football world when in the following round they faced Arsenal at Highbury. A crowd of 55,178 saw Bedford coming from two behind to draw with the Gunners taking them to “The Eyrie”. Just over 15,000 nearly witnessed the biggest shock in the history of the game when Bedford were 4 minutes away from dumping Arsenal out the cup before losing 2-1 in extra time. The following season Bedford had another money making run when they defeated Norwich 4-2 in front of 14,500 fans, and on their travels in the second round 23,000 saw them go out 1-0 at Reading That same season and the season after Bedford were runners up in the league under Kelly and Gardiner, but in the 1958/59 season was to be the icing on the cake when they became Southern League Champions. The league had been split into two division on a geographical basis and more teams added. Bedford took the West section and defeated Hereford 2-0 at their own ground to lift the shield. Kelly left Bedford in 1959 and Gardiner continued with the club as physio. Rooke returned for his second spell as manager but was sacked in 1961 due to poor results. Gardiner took over as stand in manager and had a few mediocre months until the club designated a new man at the helm. Dougie went back to his bag man job and slipped into obscurity as Bedford lurched into the dark days that finally saw them fold. An amazing story about an amazing man who wore the famous gold and black. Adam, Alexander,Bell,Ross,McCulloch would be names that would conjure up the sight of a Scottish international defensive line, but amazingly these names belonged to one person. This same person was to don the famous black and gold before carving a out a living in the Scottish leagues and the lower echelons of the English divisions. Born in Crossford near Lesmahagow on the 4th of June 1920 McCulloch was to grow up into mould of a post-war centre forward , a towering figure with a toned girth who could turn and out jump defenders with ease. His height gave rise to his nickname, the “Big Man” a moniker lauded onto him by the supporters of his first senior side Third Lanark. 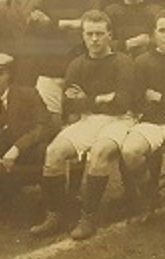 Described by Thirds historian Bert Bell as a hard but fair player, with a great eye for goal he became a deadly striker with Talbot and the teams that followed. Such was his reputation that the local newspaper in Ramsgate where he ended his football career, had him down as a classy finisher who was deadly with the head. Like many other promising footballers of that era Adam McCulloch’s early career was lost to the war and after one season at Beechwood he left Talbot for Third Lanark in the summer of 1946. As a relatively unknown player outside the Juniors he enjoyed a scoring debut in September when he bundled Queens Park keeper Bobby Brown over the line to win the points for the “Hi Hi”. McCulloch spent three seasons at Cathkin Parkwhere he bagged 53 goals with his last being a double in a 5-1 rout of St Mirren in September 1946. At 29 years old McCulloch joined Northampton Town in June 1949. The “Cobblers” were struggling in the old 3rd Division (South) at that time, but after a few months in the reserves he made a scoring debut against Newport County on the 1st September 1949. He became a regular in the Northampton side making 104 appearances, scoring 43 goals in three seasons. His last goal for the “Cobblers” was against Watford on Christmas day 1951, his final appearance in Northampton colours was against Torquay United in January 1952. McCulloch left that month, but joined Shrewsbury in June where he played for over a year notching 53 appearances and 17 goals. Leaving Shrewsbury he joined Aldershot where he played until 1955 racking up 83 first team starts and scoring 34 goals. Now aged 35 McCulloch signed for his last ever club Ramsgate who played in the Kent League. Once again he proved to be a prolific scorer and in his first season he helped the club reach the first round proper of the FA Cup, the first time the “Rams” had ever been that far. Unfortunately Watford stopped them in their tracks 5-3 in London with a crowd of 12,000 in attendance. Ramsgate went on to win the Kent Championship that season scoring 108 league goals, McCulloch putting his name to 49 of them. He lifted a league winners badge the following season, and by the 1957/58 campaign he was making fleeting appearances. Before the turn of the decade he emigrated to Australia, but returned soon after. McCulloch’s son Andy followed in his father’s footsteps, turning into a prolific striker playing for Cardiff, Oxford, Sheffield Wednesday, Crystal Palace and Brentford. He was also capped once for the Scotland Under 23’s due to his father’s nationality. McCulloch’s daughter kept football in the family by marrying Fulham defender Ernie Howe. Adam McCulloch another Talbot great. Special thanks to Bert Bell from www.thirdlanarkac.co.uk. Also Frank Grande the Northampton historian. 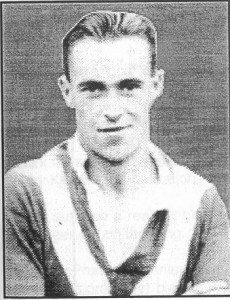 Described as the perfect centre forward who could strike a ball with both feet, James “Jimmy” McConnell was to become a Talbot hero and part of Carlisle United folklore. A footballing nomad who plied his trade in three different countries leaving a story which is remarkable and if not then exceptional. Born in Ayr in 1889 McConnell served as a teenager with the Royal Field Artillery in Egypt at the end of WW1, from their he took to the mines in the Ayr district but started his football career with Kilmarnock Victoria a juvenile side at that time. At the start of the 1919/20 season he was invited by Talbot for a trial in a couple of friendly matches where he scored a single against Muirkirk Athletic and a treble against Cronberry Eglington. He made his debut for the club on the 23rd of August 1919 in a league match against Catrine Juniors but on this occasion he failed to find the net. However he made up on his next outing by grabbing a hat trick against Irvine Victoria and in his following 16 matches he racked up 19 goals including a hat trick against Cumnock Juniors. It was in the Ayrshire Cup that McConnell made his name scoring in every round right up until the semi finals. In an Ayr & District Cup defeat by Catrine he was badly injured which ruled him out of the semi final of the county trophy against Glengarnock Vale. However this tie went to three matches and although McConnell took part he failed to score. Talbot overcame the Vale 2-0 at Saltcoats to set themselves up with a final appearance against Irvine Meadow at Rugby Park. On the 8th of May 1920 Talbot won the Ayrshire Cup for the first time defeating Irvine Meadow 3-1 in front of 5,000 at Rugby Park. McConnell was still carrying an injury by the time of the final so his position was swapped to inside left while “Tyke” Nisbet was moved to the centre. McConnell soldiered on through the final but it was Nisbet that scored all of the Talbot goals securing the trophy for the “Bot”. Nisbet joined Ayr United a week after the final signing off with a winning goal against Craigmark, while McConnell finished the season playing his last match for the Talbot in a 1-0 defeat by Cumnock in the Mauchline & District Cup final. The talented striker also won a cap for Junior Scotland against the Stirlingshire X1 in 1920. Mc Connell signed for Nithsdale Wanderers at the start of the 1920/21 season, but he jumped ship for North Ayrshire rivals Stevenston United the following season. Whether he was lured to United by delusions of grandeur due to the “Lousies” winning the Ayrshire Senior Cup in 1920 and then adding the Western Senior league championship remains a mystery, but by 1922 United had folded and McConnell found himself back at Nithsdale just in time for the Sanquhar club to join the ill fated Scottish 3rd Division. Although their first season was of no great historical detail they won promotion in the 1924/25 season with Mc Connell scoring 45 of the Wanderers 81 league goals. In the 2nd Division the following season they fared remarkably well considering the size of the club and commanded a mid table position with McConnell racking up 37 goals. At the end of the 1925/26 season Mc Connell made a life changing decision when he agreed to travel to America to play in the American Soccer League. This wasa time where British football was suffering from the “American Sickness” where professional American teams were offering $25 a week to play football this was treble the wages back in Scotland. Hordes of talented player joined up to this new venture and many never returned to their homeland. McConnell joined the Massachussets side Springfield Babes which was an offshoot of the city Baseball side. Famous for its rifle making and the Indian Motorcycle Company the new game of soccer was not popular in Springfield and the Babes folded as early as December 1926. New Providence Clamdiggers from Rhode Island were quick to sign up the talented forward and he saw out the season finishing mid table. Mc Connell was badly injured against Hartford and was sidelined for a number of months. He did make a couple of substitute appearances (Subs were used in the ASL where it took until 1965 before the UK followed suit) but by then the Steels had drafted in a couple of forwards and McConnell went down the pecking order. He was loaned out to J&P Coats FC at the turn of the year and scored against the Steels in the American Cup. In fact he took his new club to the final of the Eastern Section of the American Cup scoring in the semi against Fall City Marksmen, but the works team that had roots in Paisley lost out in the final against the New York Nationals 5-3. In the summer of 1928 he received an offer that persuaded him to return to Britain. Carlisle United had been confirmed that they were to be newly elected to the Football League and they were looking to strengthen their squad. McConnell was a target and took no time at all to agree terms and sign. The fixture list showed United’s first ever League game was to be away to Accrington Stanley on 25th August 1928. It took Jimmy all of five minutes to introduce himself to the Carlisle fans with a screamer that left the Stanley keeper no chance and sent his new club on their way to a 3-2 victory. He also scored in the club’s first ever home game against Bradford City in a thrilling 2-2 draw. He went on to score 42 league goals that season which included 3 hat-tricks, 8 double strikes and 1 penalty, and the club finished a healthy eighth in Division Three North at the end of their first campaign. He had a fantastic season and was soon known for being just as deadly with his left foot as he was with his right. Fast and strong, he was extremely difficult to get near once he had the ball. He preferred the Number 9 shirt and took the job seriously – goals were his mission. That amazing feat of scoring 42 league goals in one season is a record that has rarely been troubled since (only Hughie McIlmoyle coming close in the 63/64 season with 39 league goals). He continued to score regularly for United until he departed for Crewe in April 1932, netting 28 goals in 29/30, 39 goals in 30/31 and 21 goals in 31/32 – his last season with United. He scored a total of 125 league goals and 6 cup goals in a Brunton Park career spanning 4 seasons. Mc Connell spent a season at Crewe Alexandria playing 36 matches and scoring 22 goals. In 1933 he joined Rotherham where a historian described his stay at Millmoor as a centre forward who didn’t have a very good record although he probably provided ammunition for Vic Wright and Fred Briggs He did find the net in a 2-1 FA Cup second round win against Coventry City. He finished his footballing career with Rotherham playing 24 matches scoring 5 goals. By the end of his career he had scored well over 100 goals in England and Scotland a feat that was enjoyed by a small band of players, Joe Baker and Kenny Dalgliesh to name just two. He retired from football in 1934 and settled in Carlisle. He passed away in the spring of 1949 and is buried in Carlisle’s Upperby cemetery – gone, but never forgotten. Talbot were recently contacted by Dundee FC historian Donald Gellatly for information on former player Isaac Reid a Mauchline lad who played for Talbot. After much research we found our man and even a photograph of the lad when he was in the Talbot side for the 1922/23 Scottish Cup semi final against Baillieston. He made his debut for Talbot on the 11th of August at the start of the 1920/21 season where he scored in a 3-0 South Ayrshire League match against Cumnock and went on to play nine games before joining Dundee after our 2-1 Scottish Cup game against Glenbuck. 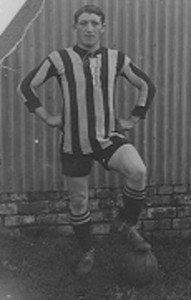 He returned to Talbot in the 1923/24 season as the photo depicts. He was never a prolific goalscorer and only found the back of the net once that season against New Cumnock United. He left us during the 1924/25 season. By the start of the 1929/30 season Talbot have three Reid’s playing for them, Isaac Senior and Junior and a Graham Reid. Both Isaac’s disappeared by March of this particular season. Also in this season Bob Shankley played for us.